The beach at Blue Hills, Providenciales. 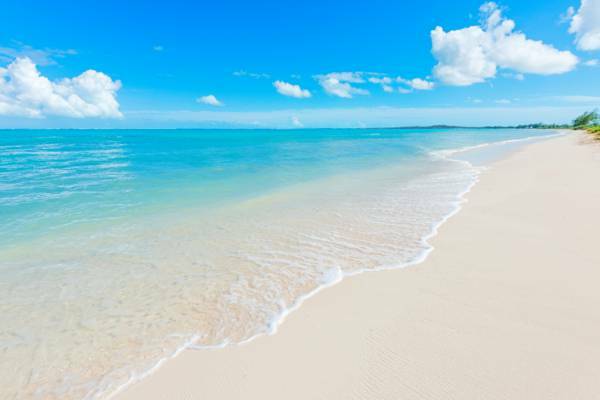 This long beach fronts one of the three original settlements on Providenciales. Although alright for a quick stop for those in the area, large amounts of seaweed in the water and on the beach limit the enjoyability. A Caicos Sloop on Blue Hills Beach, Providenciales. Found off the northwest coast, Blue Hills Beach is located at one of the three original settlements on Providenciales. The main attraction of the area is the scenic Blue Hills Road, which follows the ocean. Along this drive are views of the ocean, Caicos Sloops and coconut palms. Generally, the beach really isn’t good for swimming or snorkeling, as the water tends to be shallow with lots of seaweed and broken coral. However, the western end begins to clear up a bit. 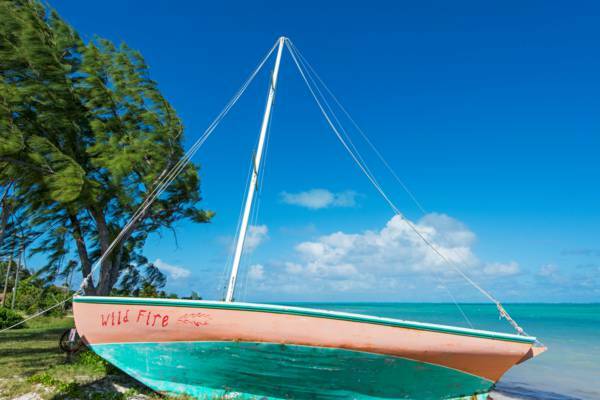 Several popular restaurants are located on this beach, Including Da Conch Shack, Kalooki's Restaurant and Bar. Also, there are a few small shops and venders selling conch shells and souvenirs. Sunny day at Blue Hills Beach. Blue Hills is one of the three original settlements on Providenciales (the others being Five Cays and the Bight) and the coastal road that front the village is one of the scenic drives on the island. The Turks and Caicos generally doesn’t have quite as much of the colourful building hues that some of the southern Caribbean islands are famous for, yet Blue Hills tends to break this rule. On this three mile (4.8km) paved road you’ll see brightly painted buildings, small sailboats, coconut tree groves and small churches. Blue Hills Beach doesn’t really have a dedicated beach access other than at the Blue Hills Pier, but many parking areas and accesses to the beach can be found along the coastal Blue Hills Road. The Blue Hills Pier and a small playground can be found at the beach access, along with ample space for vehicle parking.